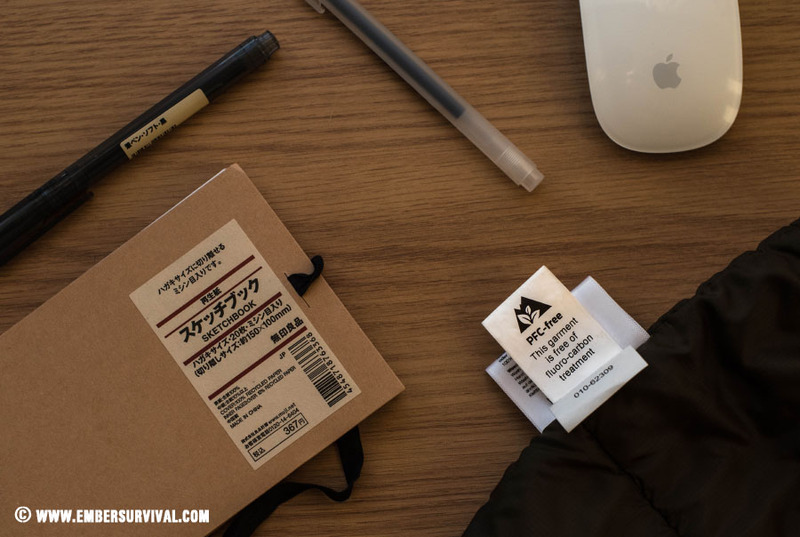 The Páramo Velez Adventure Smock is a walking, climbing, cycling and snow sports garment. It uses a tightly woven water repellent face fabric that is PFC free in conjunction with a separate layer underneath that is designed to mimic animal fur. The layers are not laminated together and it’s the interplay of these two layers that keeps you dry. It’s a fascinating mechanism at work here that copies nature and I would suggest you watch a short video that explains the process. The Páramo Velez Adventure Smock stands out but blends in. It’s a striking design that is also subtle. 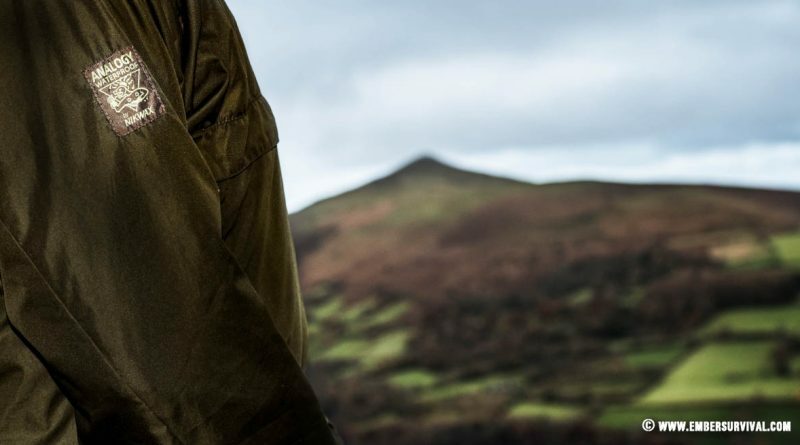 The Páramo Velez Adventure Smock is a versatile, breathable and rugged outdoor garment that keeps the rain out and manages your internal temperature very well. Using the Páramo Velez Adventure Smock over a three month period in the Swiss Alps whilst doing a mix of short day hikes, overnight wild camps and outdoor photography sessions I have had nothing but a totally positive experience with it. Back in the UK in the Brecon Beacons, Dartmoor and Forest of Dean where I was hiking and wild camping it has again all been very positive. 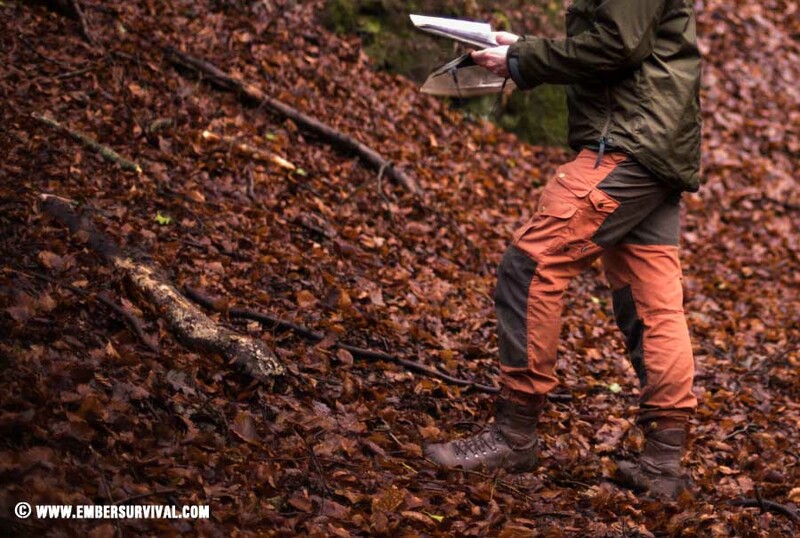 Each time I take the Velez out I come back liking it more and more, I will be purchasing a pair of their waterproof over-trousers soon as I have been so impressed. During my time in these environments the Páramo Velez Adventure Smock had to contend with high humidity, light but consistent drizzle as well as heavy thunderstorms with high winds, dense mist and also snow. Throughout all of this the garment performed exceptionally well, kept me dry and managed internal moisture better than any waterproof layer I have used so far. The hood with it’s strong peak and wrap around design keeps rain splash from hitting the face whilst preserving a good field of vision. The hood has compression straps to secure it around your head and also comes with the ability to roll it away into a pocket around the back of the neck, this keeps the hood tucked away and looking tidy when not in use. When it came to walking in high humidity the garment performed very well, the difference here is the liner that Páramo uses beneath the face fabric actually absorbs liquid moisture and pulls it away from you and your skin. This is totally different from laminates, (like Gore tex and eVent) that can only cope with water vapour. Moisture builds up on the internal surface of the membrane on these laminate based waterproofs. Whereas with the Páramo you don’t feel clammy and your layers beneath the waterproof stay drier. Really appreciate the dropped hem that covers your back very well. 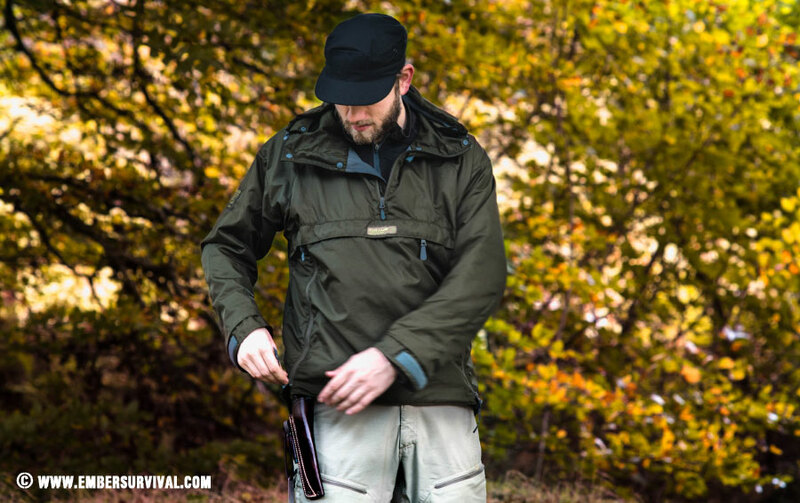 The Páramo Velez Adventure Smock is great to move around in with full articulation in the shoulders and elbows, it also has a dropped tail and a cropped front so it covers your back without getting in your way. These are the type of features normally found on much more expensive jackets. 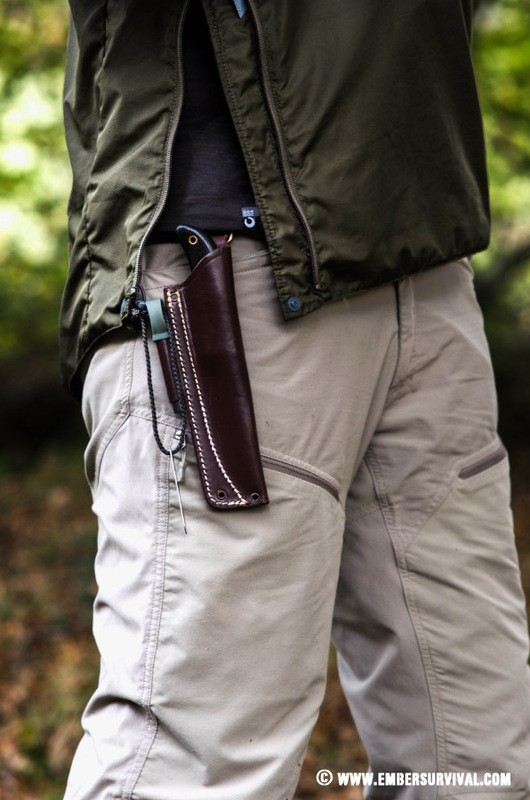 The best single feature of the Páramo Velez Adventure Smock for me are the side zips: they allow easy access to a knife without having to draw the jacket upwards to reach your belt, this is such a wonderful time saver out in the woods. The side zips also allow you to vent yourself without sacrificing protection as the smock still covers your front even with both zips undone to let fresh air in. 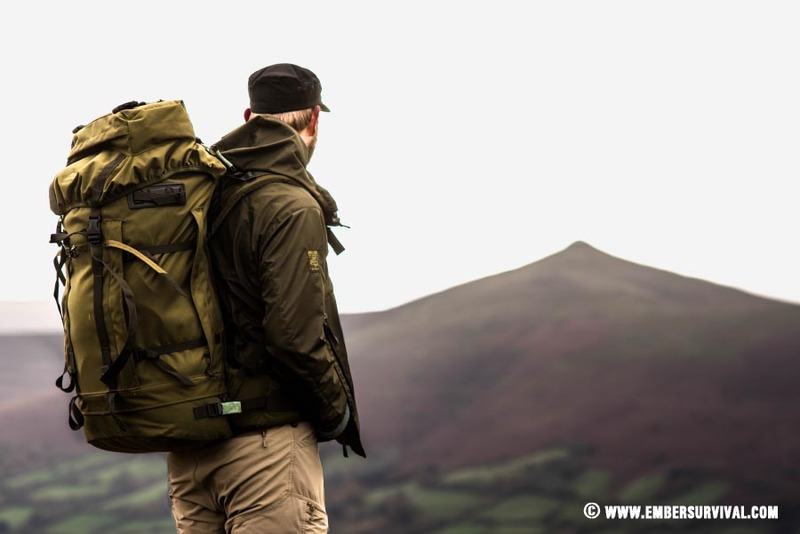 When wearing a rucksack, the side zips allow you to fasten your hip belt through the opening so the jacket can move freely and still cover you with air allowed to flow through and keep you cool. The chest pocket is large enough for an OS map and compass. 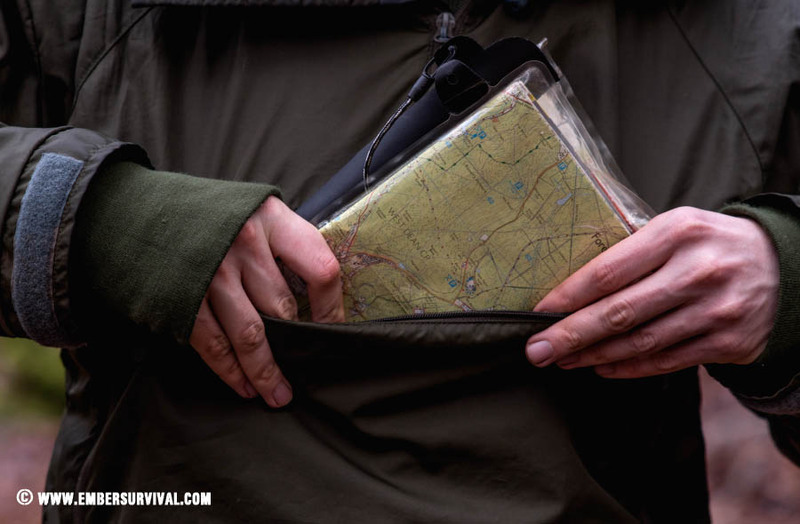 The inner pocket, which can also hold an OS map, has a nice lining which helps in hand warming. The internal hand pocket is one big pocket so your hands can share warmth. The Velez Smock has a fluorocarbon free DWR which means the repellent finish does not use aggressive chemicals in order to achieve its high level of water repellency. A recent scientific study concluded that per- and poly-fluorinated compounds are damaging to the environment and human health. Most outdoor brands rely on these chemicals to get their performance but what price are you paying for this? The very handy chest dump pocket on the Páramo Velez Adventure Smock. The Páramo Velez Adventure Smock is a great waterproof jacket. I like the way it works with you. So much so that you can forget you have it on as it’s so comfortable and breathable. It negates the need for a soft-shell as its so breathable. It’s fantastic that it’s PFC free and still able to keep you completely dry. One can replenish the DWR with washing with NikWax, a water based repellent. This should be done regularly. I have not tested the jacket on a long multi-day expedition and it will be interesting to see how the garment holds up to prolonged multi day use. However I feel confident. Update May 24th 2018 – After using the Velez Smock during a heavy thunderstorm that produced 58mm rainfall in an hour. I can say that water did penetrate to layers beneath the jacket. Páramo does work closely with some of their factories that produce some of their range to make sure its ethical. They have a partnership with the Miquelina Foundation in Bogotá, Colombia. Training and employment as well as homes and childcare are offered to women at risk of prostitution and drugs. Over 80% of Páramo’s annual production occurs at Miquelina. All garments manufactured there now carry the World Fair Trade Organization Fair Trade label. This is unheard of from most other outdoor brands and it’s certainly something different that Páramo is doing. Read more about Páramo ethical practises HERE. Read our other review on the Páramo Enduro Jacket HERE.